Great hostel. Pricey but it was worth it being in the middle of the red light district (walkable to everywhere!). Breakfast was great (included). Private room was perfect with tv and en-suite. Smoking is allowed in the dining area but the smells did not travel upstairs. Would stay here again. 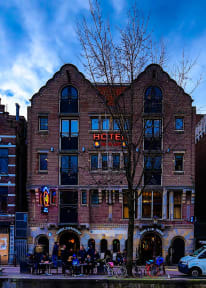 I crushed there for one night cause everything was fully booked because of Easter and kingsday and the hostal was way better than I expected !. The room had a funky smell but I believe it was because there were 3 guys sleeping the whole day windows closed but those things are part of traveling. Anyways, the staff was super friendly, Gave me a few suggestions which was amazing as I’m traveling on my own. The bar and breakfast were good too. I wouldn’t stay for a week but I would go back again. I really loved this hostel and the environment of it. Stayed in the all female room for the comfort and security. Lockers were large to fit a lot of our stuff, the beds were super comfortable, and the room itself was spacious with a toilet and separate shower in the room. 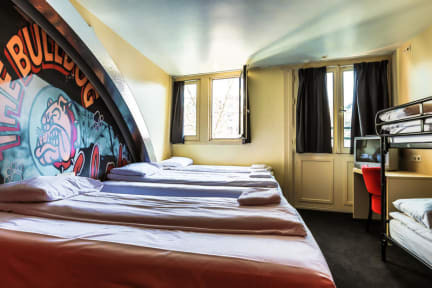 As for a hostel, these beds were definitely one of the most comfortable I've stayed in. My friend and I LOVED the bar downstairs! Order the extra cold Heineken!! Best bar in all of Amsterdam. Great location & friendly staff. The staff here was just incredible, the atmosphere and being able to hang out in the bar was also really nice. It is located close to everything you want and need. If I ever come back to Amsterdam this is the place I'm going to stay again. Was expecting better facilities with the name bulldog. It's like an old school hostel. Limited variety for breakfast. But for the price it's good. I just needed a place to crash for one night and the Bulldog was perfect. Location was ideal in a very vibrant area of Amsterdam, easy to reach the central station (10 mins max) and other parts of the city by foot. The staff were fine, breakfast was a good selection of continental meats and cheeses etc., bring a padlock for your locker and you're good to go. Shower in the room was fine and relatively clean, Good atmosphere in the bar and social spaces. For the amount you pay here you would expect a whole lot better. The location is good but the hostel itself is dirty and old fashioned. The bar doesn't really invite a social atmosphere, it's just for tourists who want to get stoned. Security wise, I was given a pass that was supposed to prove to door staff that I was staying there but i wasnt challenged at all.